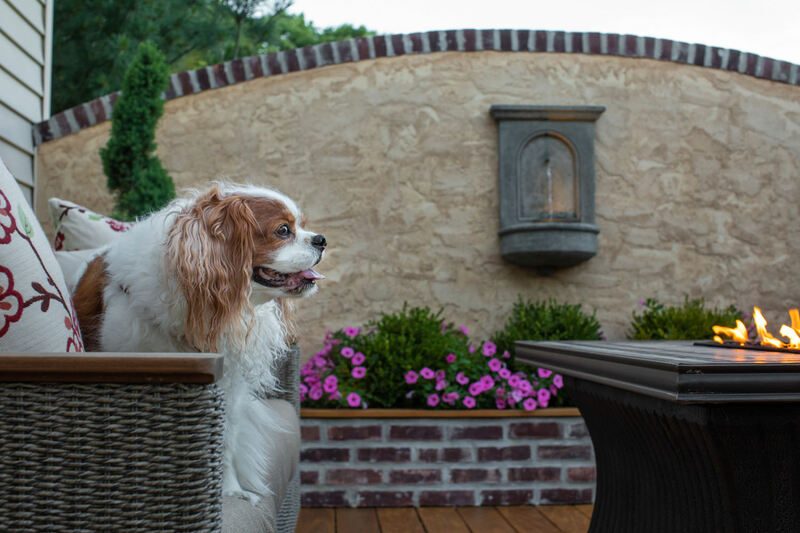 These clients were completely uninspired by their existing deck and patio and contacted MasterPLAN to reimagine and bring new life to the space! Challenge accepted. This first generation Trex deck has seen better days! The homeowner reached out to MasterPLAN to reimagine the space to include several fun features! The construction of the previous deck was unappealing to look at. This under deck space was very uninviting and the deck itself was too small to do much of anything! 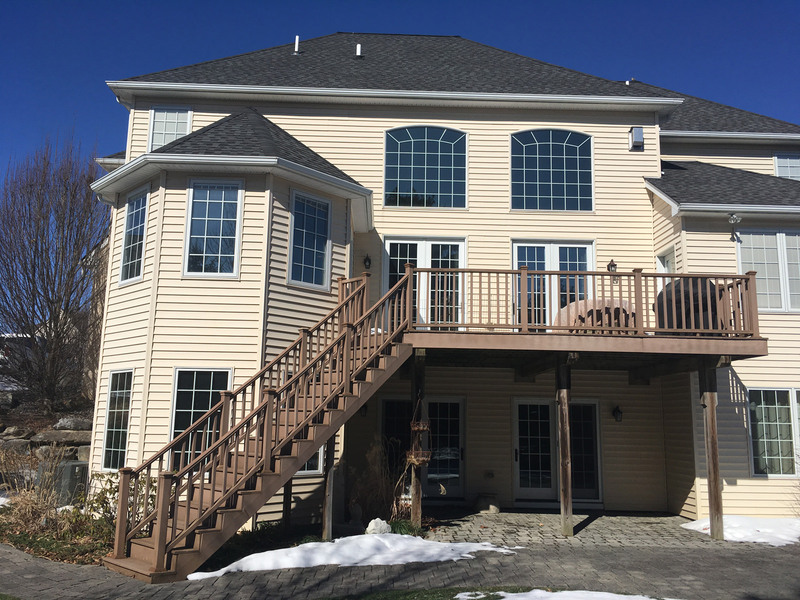 We enlarged the deck and extended it all the way to the end of the home, providing ample space for entertaining up top, and plenty of covered space below. 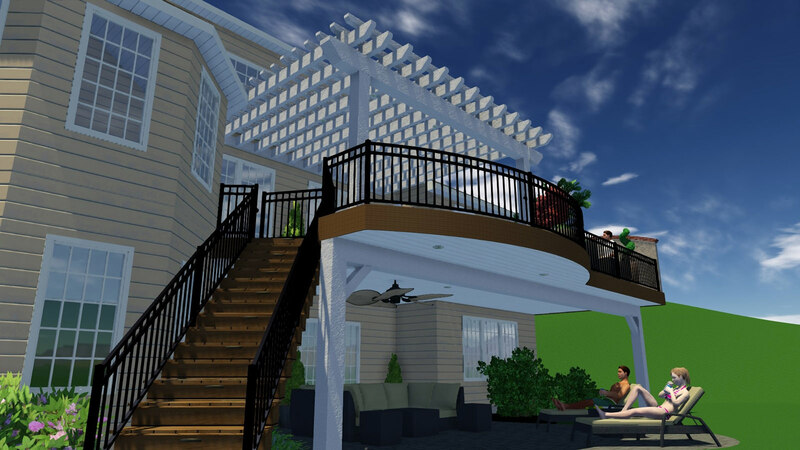 Our 3D design was super helpful for the clients to realize the true potential for their under deck patio space! 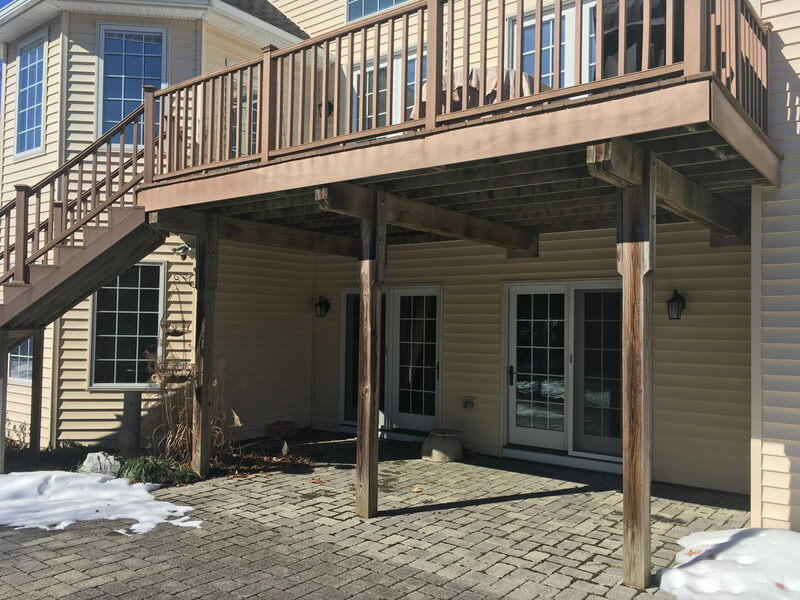 The additional square footage of this deck really makes a difference! The homeowners now have ample room for dining, lounging and entertaining…all at the same time! The sound of the soothing water fountain, the fragrance of the flowers and the warmth of the fire make this spot perfect to relax and take it all in. The new deck is such a hit, all members of the family want to be outside! Could you see yourself enjoying a nice dinner or having some wine with your favorite people here? We sure can! Follow the paver path from the driveway, and you will be greeted by this warm and welcoming outdoor living space. 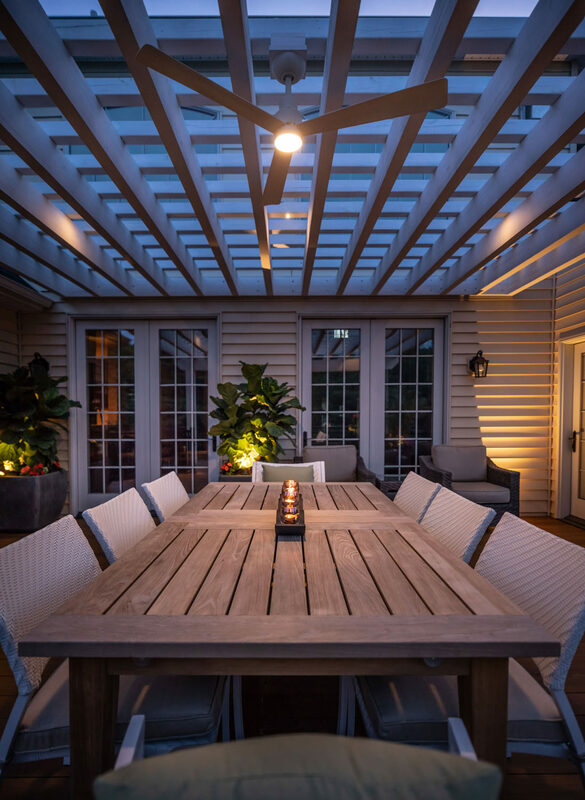 The lights in the pergola are so intriguing, you will want to see what awaits at the top! We have to give the original installer credit, they were definitely creative when building this deck. To start, this structure was supported by too many plain posts underneath. The posts ended up block the view into the yard and acted as foot traffic roadblocks. The decking itself was a very early version of Trex, which the contractor fastened through the board with surface screws. Not only were these visible screw holes an eyesore, after a while, they began to pop up to the surface. The boards eventually began to heave and warp, simply looking unattractive and didn’t do the home justice. To add character to this space, we decided to use Ipe tropical hardwood as the decking material with a hidden fastening system. Ipe is an extremely dense and durable hardwood that has a natural resistance to rot and insects, perfect for a home that has been plagued by flying pests in the past. This decking selection has warm and rich natural tones, which plays off of the home and complements it at the same time. Our new design expanded the overall footprint of the elevated outdoor living space and included features like a curved front for subtle charm and a rounded feature wall at the end for privacy and to act as the main focal point. Drawing inspiration from the front of the home, the feature wall is finished with brick and stucco to bring cohesion all the way to the back. Per homeowner request, we found the perfect portico fountain and mounted it to the feature wall, giving the space relaxing sounds of trickling water and movement with a Tuscan flair. Just underneath the fountain, we planted perennial boxwoods for year-round color and surrounded them by beautiful petunias for splashes of color. Flanking the fountain, we incorporated two tall planters to create a vertical interest to the space, and integrated fun spiral arborvitaes for added height. In front of the feature wall, we have our relaxation zone. 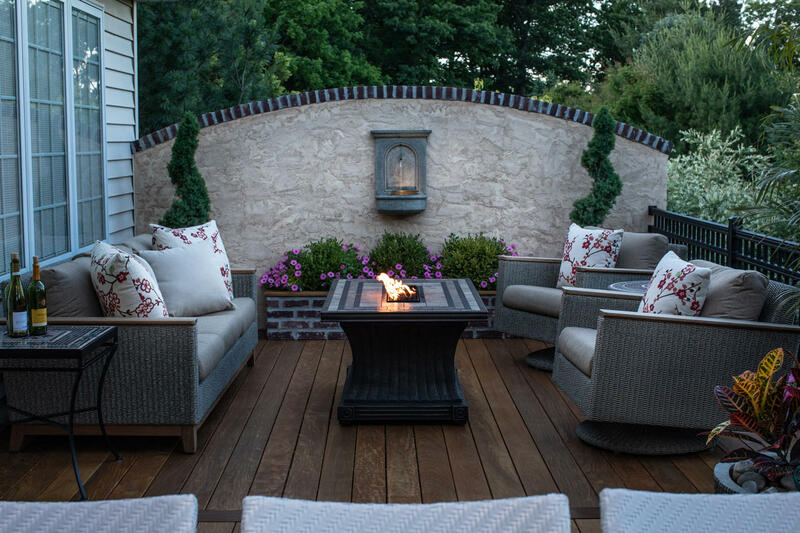 The homeowner placed beautiful and comfortable furniture around the fire table, creating a very soothing area to shed the stresses of the day. 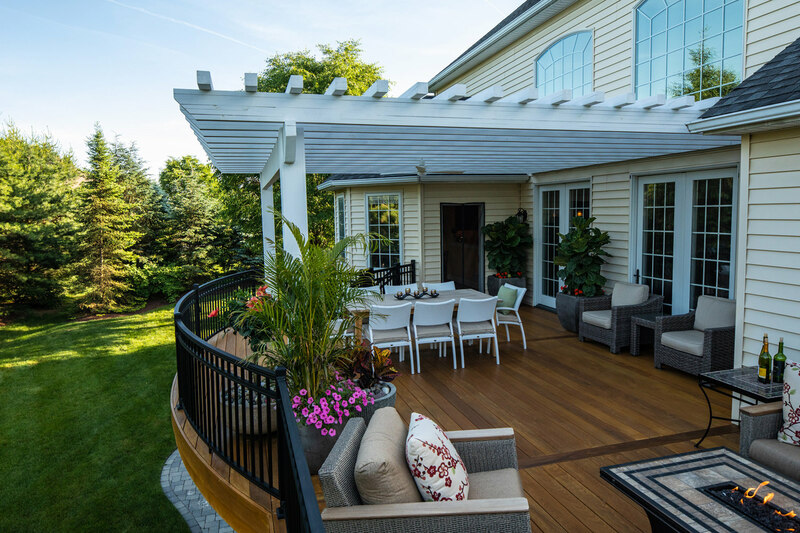 The homeowner always had a dream to be able to incorporate a pergola in her outdoor living space…ask and you shall receive! 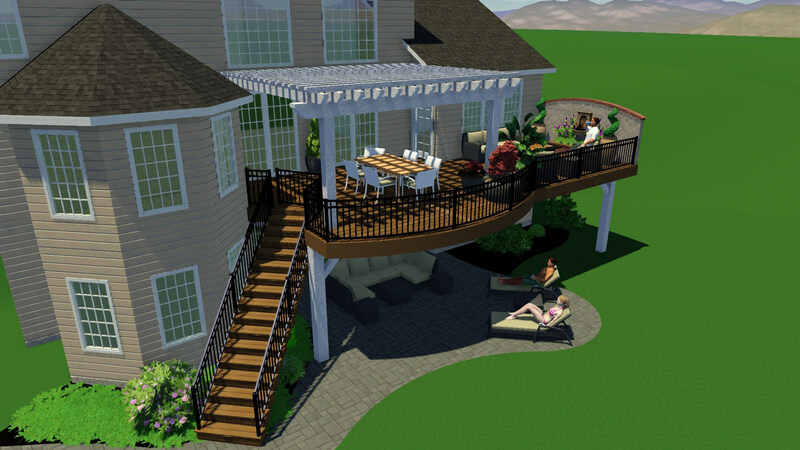 We integrated an engineered custom pergola on the deck, which was designed with a more traditional aesthetic with simple details. Star lights were installed in the upper shade beams of the structure to add just a sweet hint of light during the evening hours. We also included an outdoor, wet-rated ceiling fan to create a cool breeze and keep the bugs away from the dining table underneath. Hints of color can be seen in the nearby planters, highlighted with accent lights to set the tone. The teak dining set along with the nearby rustic wicker lounge set certainly make this deck space inviting. Moving down the staircase, every other step has an under-tread light to light the way to the paver patio. Being that the existing paver patio was still in decent shape, we left it in place and power washed it to bring it back to life. Looking up, gone are the original exposed ugly deck beams! When rebuilding the deck, we knew that the under deck had to be as beautiful as the rest of the project. We finished the underside of the deck with painted white 1 x 6 boards, spaced 1/8” apart, which gave the space a finished look and enough space for airflow and water to escape. Weatherproof underdeck lights were installed to illuminate the patio space at night. 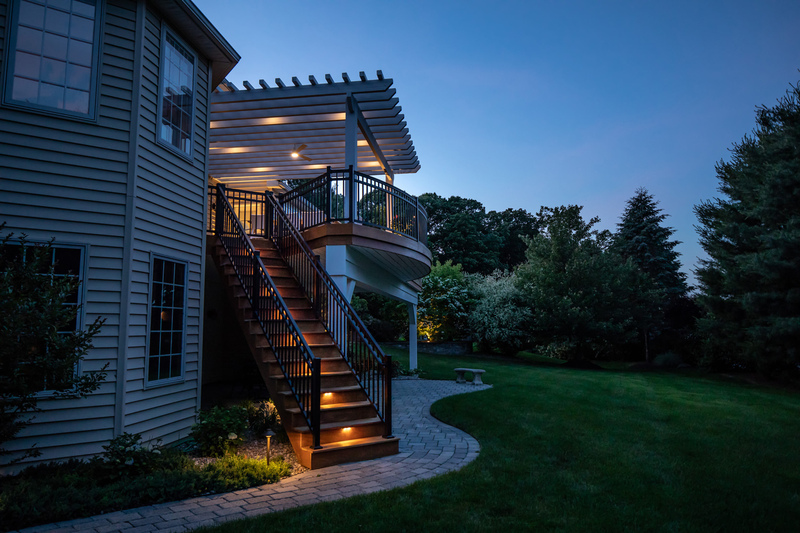 In the end, MasterPLAN was able to transform the homeowner’s unpleasant deck space into an absolutely stunning outdoor living space that exceeded their expectations. This is the MasterPLAN difference! "We are thrilled to be able to say without any hesitation that if you are looking for professional, personal, unique and top quality design, material and construction you have to look no further than Josh and MasterPLAN."